Three years ago, Ron Capps lost to Jack Beckman for the Funny Car Championship by two points. Today, Capps and Beckman faced each other in the final round of Funny Car at the 28th annual O’Reilly NHRA Springnationals. Capps defeated Beckman, as he went 4.24 at 258.32 mph. Beckman went 4.48 at 205.16 mph in the losing effort. This is Capps’ second win of the season. He also win the Amalie Oil NHRA Gatornationals when he defeated rookie John Hale in the final round. Both cars were close through 660 feet. Then, they each had trouble with the tires and fishtailed. Capps was able to recover, as Beckman had more trouble with his car. Unfortunately, it was too late for him, as Capps drove past him. 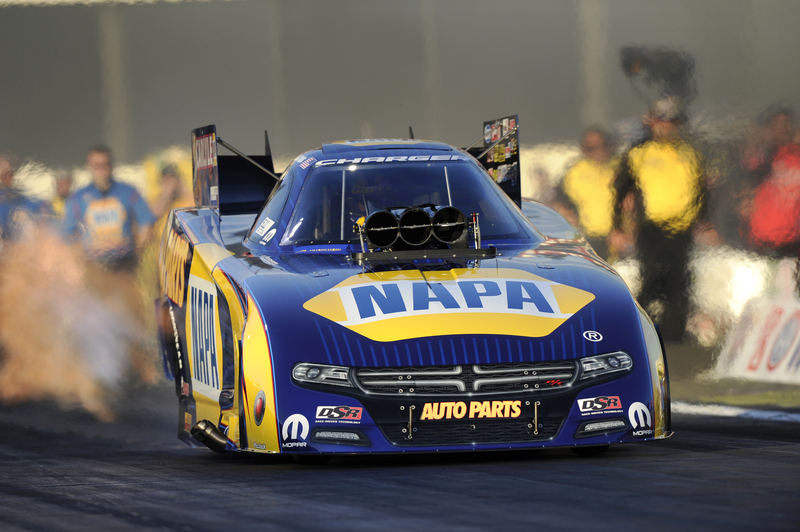 This is Capps’ 45th career win – 44 career wins in Funny Car and a Top Fuel win. He’s the second winningest driver in Funny Car, trailing John Force, who has a 142 wins. The Napa Know How driver is 24-12 all-time against this teammate. Of the 44 wins, three of them have come against Beckman.